As it is recognized, KARAOKE is one of the most effective ways to promote and perpetuate the great musical themes in time. 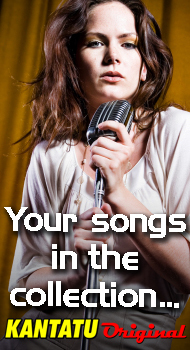 When a theme comes out in karaoke, it is sung and "adopted" by thousands upon thousands of people, fans of the original artist, who sing it not only in karaoke spaces, but also at private parties with friends and especially at their preferred artist's concerts by creating choruses of hundreds or thousands of people singing with the artist! A good karaoke cover is the one that most resembles in audio terms to the original theme, in the same tone, with the same beat, with the same harmonic nuances and with the same instruments. And that's what KANTATU has done over the years, being our brand recognized for the quality of playbacks. Yet, nothing more "like" the original, than the original itself. Thus, for some years KANTATU has created a series called KANTATU ORIGINAL, where the playbacks used with the respective backvocals are the ORIGINALS OF THE ARTISTS. Already joined to our project many Portuguese artists, among them: Toy, Sérgio Rossi, Mónica Sintra, Ana, Lucky Duckies, Nuno Barroso, Luis Filipe Reis, Os Alcorrazes, Nucha, among many others. KANTATU establishes a licensing agreement for the original playbacks for exclusive use in Karaoke, with the legitimate copyright holder of the playbacks, which sometimes is not the singer but the publisher, with a payment by each digital download made by our customers. Authors Copyright is paid directly to SPA or to the author / composer if he is not registered in SPA. Often, it is the artists who bear all the production costs of the master. When they sign a contract with the publisher, they usually transfer to the publisher all rights to the master. But it will be important to note in the contracts that the transferred rights shoulkd be only for the song with voice, reserving for themselves the Rights on the playback. In this case they will be able, without more limitations, to give it to KANTATU to be able to produce the karaoke content. We have several examples of artists, still little known, that when giving the playbacks to KANTATU, they managed to make their songs well known, and many people adopted them and began to sing. - Original playback in WAV format with backvocals if they exist. KANTATU will prepare the contract draft that we will send you by email. Once signed, we will be producing and releasing your songs that will be included in thousands of karaoke lists throughout the country! And from your side there is nothing to pay! You only win with this system! FOR YOU AND FOR YOUR SONGS!